If we project the future of the unaffiliated in US based on the growth rates from Pew's latest survey, then by 2050, at a growth rate of 6.7 percentage points every 7 years, the number of unaffiliated by 2050 could be 56.3%, a majority. 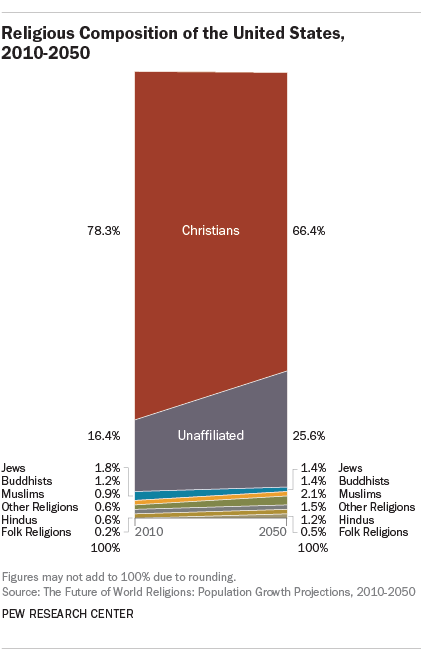 At a growth rate of 6.7% every 7 years, by 2050 the unaffiliated will be 31.5%. In terms of raw numbers, from 2007 to 2014, the numbers of unaffiliated in the US went from 36.6 million, to 55.8 million, an increase of about 19 million, and of 65%. At the rate of growing by 19 million every 7 years, by 2050 the number of unaffiliated Americans will be 150 million. And at the rate of 65% growth every 7 years, by 2050 they'll be 218 million. Will any of these be the case? Will the growth rate slow down? Will it speed up? Who knows. It's really hard to project these kinds of things, and I'm not an expert on it. But I can say with reasonable confidence that the Pew report is flawed and that the growth of the world's unaffiliated will likely be much higher than they've projected. 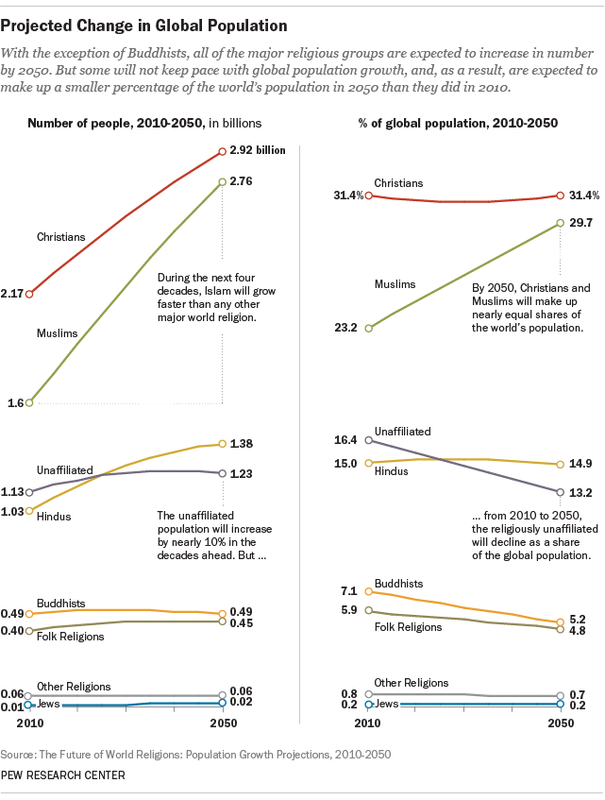 Pew's projections of religious affiliation from 2010 to 2050.